Its new design completely integrates the blade for unrivaled aerodynamics. Equipped with a carbon body and blade, the Blade Carbon is available in a Ti version (titanium spindle) that weighs a mere 95g per pedal, or in a CrMo version (chromoly spindle) for a weight of 110g per pedal. It is available in three tension release levels: 12,16 and 20. Special attention has also been given to ensure that it is water resistant. Weather resistance has been improved by 120% for even more reliability and longevity. To accomplish this, the new spindle received an updated endplug with an o-ring washer and has also been equipped with an internal, double-lipped seal. LOOK axles are only approved after a rotational test of 2 million cycles at 100 rpm with a load of 90 kg on the center of the pedal and an eccentric rotation (which creates stress on each revolution). This is equivalent to a sprint by André GREIPEL of 1700 watts at 100 rpm for 333 hours! This test is much more demanding than the current standard, the EN14781. The platform of the CARBON BLADE is fitted with a 67mm-wide stainless steel plate, optimizing the cleat/pedal contact areas, regardless of pedaling angle. Excellent pedals. 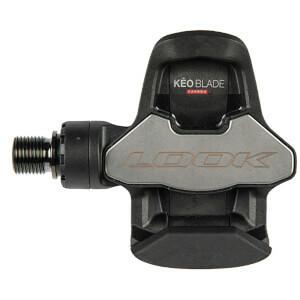 I’ve been using look Keo pedals for about 10 years. These are an amazing upgrade to the Keo. Lightweight, long lasting cleats, very positive feel during engagement and disengagement. As a heavyweight, I truly appreciate the wide platform. 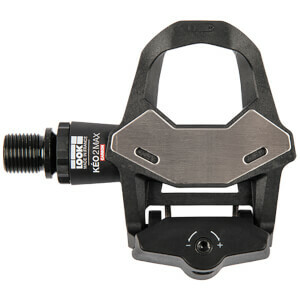 Review for chromo axle..... Feel better under foot from much older Keo pedals. More secure. Bearings smooth. slightly harder to unclip but not by much. Good service from Probikekit.